The garden outside is currently in a circular pattern of freezing and thawing. Soon my time will be spent outside cleaning beds, fertilizing roses and pruning winter tree damage. Inside the house there are some inexpensive plant ideas to give one some Mother Nature therapy that does not require boots and gloves. These small splashes of color and green can be singular statement or multiplied to “cheaply” impress someone. Golden Club Moss ($5.00 to $7.00 per pot) remain in their grower pots and are inserted into galvanized tin containers with fluted, punched edges. Alabaster eggs or blown-out eggs make a nice nest out of these mossy clumps. Several pots placed down the center of a dining table will add color and the short height will not impair lines of sight. Over time these plants will become “leggy” and they need constant moisture and low light. 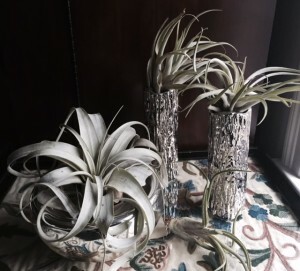 A collection of air plants ($5.99 – $19.99 per plant) takes root anywhere there is air, light and moisture. Misting will help on the moisture side. A good soaking in a tub of water every week or so will keep them happy for a long time. Here they are placed on top of unique mercury glass and silvered ceramic vases. The silver on silver tone is an appropriate seasonal look for winter. Come October they can be creatively thrown in to a basket of faux rubber snakes or skulls, adding organic creep to your fall festivities. Now that Valentine’s Day has drifted by in a wintery chill, plan those colorful displays that encourage spring to break out. Forced bulbs provide color and scent to a room. 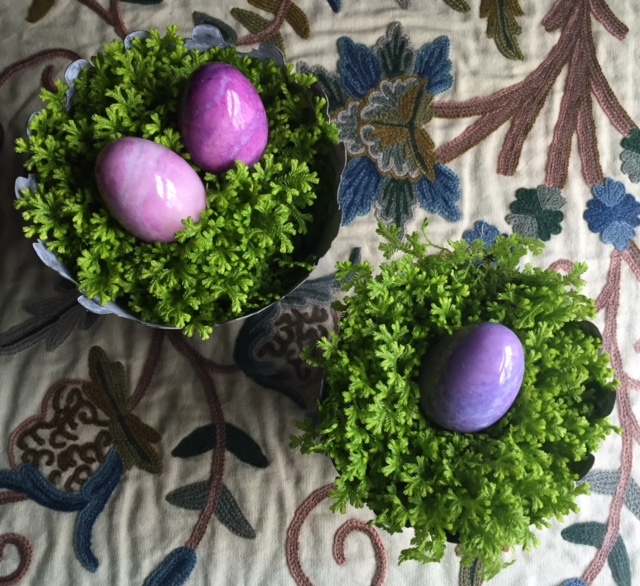 Hyacinths bulbs ($3.99 to $14.99) can be found with forcing vases included. The bulbs need to be chilled about five weeks therefor buying from a supplier online can save one some time. Simply put the bulb atop the water but keep the bulb from sitting in water to prevent rot. Vase should be kept 75 percent full with water to keep roots from drying. 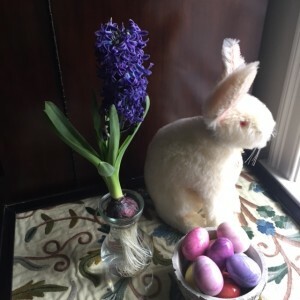 Mix the blooms in with your collections of bunnies or springtime ephemera to boost their impact.